Oh Hey There! 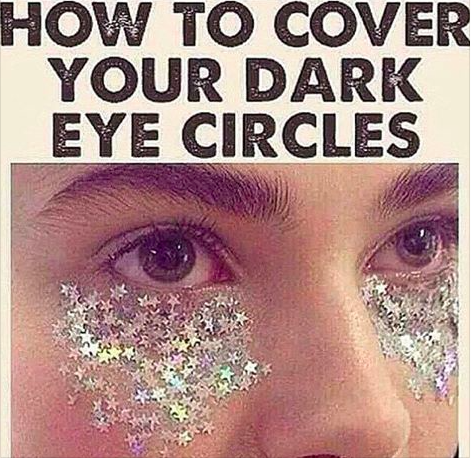 : How to Cover Your Dark Eye Circles. Or not. Somedays I go for this, others I choose eye cream. This may be a weird image for some but I fell in love with it the moment I saw it. Whilst I like finding new beauty products, playing around with my makeup and physical appearance, I often find the beauty world very overwhelming. Whether it be the bombardments of airbrushed models to demands that we lose weight or even just the sheer volume of products to cover dark eye circles. Its often hard to evaluate how we feel about ourselves and our bodies because of so many, loud, in your face, external voices. It can make it hard to hear our own anymore. Don't get me wrong, I have spent hours looking for a good eye cream. It's just somedays, I am not that into it. Sometimes I really just don't care how I look, or I feel more comfortable just scraping my hair up and wearing sports bras. Some days I prefer the way I look without makeup on. This isn't to say I have no hang ups about my appearance, I really do, but sometimes I will put makeup on, look in the mirror and I don't recognise myself. Other days I am sick of looking the same way. I can spend anything from 1 minute to 2 hours in front of a mirror, depending on mood. Some days, I change my appearance because I feel pressured too or I feel self conscious. These days, sadly, are not so fun. They can make me feel sad, anxious, like I am letting myself down or even angry. I don't wish these days upon anyone else but the chance is that you too have them. And that, is completely fine. It's an unfortunate, but rational, response to our surroundings. We are constantly being told to change, not because we want to and how we want to, but because we should and how we should. To expect this to have no effect, is a big ask of ourselves and others. Whilst I try not too feel this way, I don't beat myself up for it, I just try to recognise it. For me, if I recognise it, I can enjoy those days when I am having fun with my appearance, to their fullest. On these days, like any normal, human being, I might just be bored. It can be refreshing to see a slightly different face and in turn, perhaps a different side of yourself. Some people like to do this everyday or the majority of the time, others are happy trying this out once in a while. You may be like me and go through phases of both. It can also be nice to pay attention to your appearance because you like it, you feel happy in your own skin. You might want to enhance certain features or maybe even downplay them if you feel like it that day. You can celebrate your body and love it for all it is, whilst still mixing it up. In fact, something which I don't think people tell each other enough, you can do whatever you want! Whilst altering your appearance can be due to pressures or anxieties it can be for happy and positive reasons as well. Taking time to recognise the reasons behind your actions can shed new light on them and make you aware of your motivations, good or bad. Was it something I wanted to do for myself or did I feel that I had to? It is not about what you do, whether it be a hair cut or even going down the cosmetic surgery route, but why you are doing and who for. You may realise you like having guidance in your appearance and like following trends or you may discover you are happier with no external input. Ultimately life is about being happy. So, whatever it says, try to hear your own voice in amongst the white noise. Do you find the beauty world overwhelming at times too? I love this post. I've stopped reading glossy fashion mags because I felt like they always made me feel poorly about myself. Instead I get my make-up advice online when I want it. Thats great! I have to say I do avoid them somewhat but I do still like to read them from time to time. For me its just about no immersing yourself in it and seeing how carefully sculpted it all is! Yes I completely agree with you, it's so important to take a step back sometimes and really think about things. I do find the beauty world so overwhelming, I'm someone who has no clue what to do with make up and I get confused with all the different types and brands! I enjoy reading beauty blogs, but I almost never wear make up, and when I was growing up and everyone around me started wearing it every day, it overwhelmed me and made me feel self conscious because it was all about being perfect. I like make up best when you can be a bit silly and playful with it. I like to wear bright or fairly light lipsticks sometimes when I do wear make up because I feel like I can apply it imperfectly and look fine without aiming for some non-moving, idealised look. Make up can be great fun, but we have to look at our attitudes to it. As soon as I did it for fun and without self-consciousness I felt I finally "got it".